Digital badges from Scaled Agile give SAFe-certified professionals a way to display their verified skills on a variety of social and web-enabled platforms. Scaled Agile, Inc. (SAI), provider of SAFe®, the world’s leading framework for enterprise agility, today announced the Scaled Agile Professional Certification Program digital badging initiative. This new feature will help SAFe-certified professionals connect with the best opportunities to use their skills and experience, and give employers the ability to quickly validate an employee’s knowledge and skills. Scaled Agile is teaming with Acclaim, a leader in digital professional recognition, to roll out digital badging incrementally starting this month with select SAFe certifications. 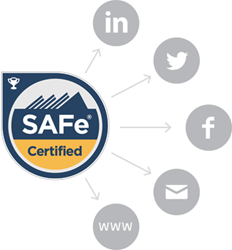 Nearly 50,000 members of the SAFe community—those certified on SAFe 4.0—are eligible for a badge. Those certified on SAFe 3.0 or earlier will have the option to re-certify on SAFe 4.0 to earn eligibility for digital badging. To learn more about digital badging with Scaled Agile, please visit scaledagile.com/digital-badging-faq.